In our last blog we learned of one way to prevent cavitation bubbles from forming at a centrifugal pump inlet when we simply added more water to the storage tank, thereby raising the water level and with it the water pressure at the pump’s inlet. Today we’ll discuss another way of reducing cavitation, by increasing water tank elevation. where γ is the Greek symbol gamma,representing the specific weight of water, (0.036 pounds/inch3), and h is the depth of the water inside the tank. 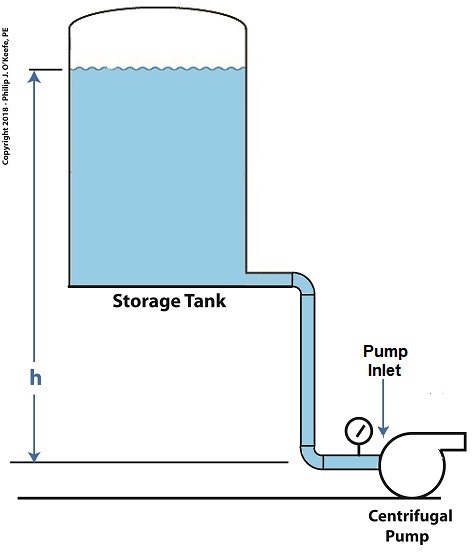 This formula applies to another scenario as well, that of raising the entire tank’s elevation with respect to the pump, as shown in the illustration. Here h is the height of the surface water in the tank with respect to the pump’s inlet. The equation tells us that the higher the tank is elevated, the greater the pressure at the inlet and the less chance there is of cavitation bubbles forming. How high do we need to elevate the tank? We’ll do the math next time.